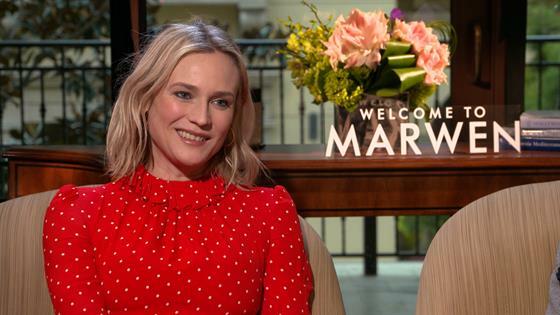 It's going to be an unforgettable season for Diane Kruger. With the holidays getting closer and the release of Welcome to Marwen weeks away, it's safe to say the actress has a full plate on her hands. But more than a month after welcoming her first child with Norman Reedus, the new mom is ready to open up about her growing family. "It's already chaotic in the house. I don't think it could get any worse," Diane joked to E! News before her new movie hits theatres. "It's a great moment of joy. We have a lot to be thankful for. It's been a wonderful year." She added, "I'm just looking forward to having my own little family and be together and have take-out because I don't think I can step away to cook." With the Christmas season also comes holiday traditions. Although both Diane and Norman come from single mother families, the Hollywood star is looking forward to starting new rituals. "What's exciting is to start your own and anything is possible and as long as my home is happy and light and positive, it doesn't matter," Diane explained. Awww! While promoting Welcome to Marwen with co-star Janelle Monáe, Diane also let it slip that her first child is a baby girl. "She's very little, but I'm tired," the proud mom shared with Extra. "I feel like a superhero right now." Family aside, Diane is more than ready for moviegoers to experience Welcome to Marwen. The project tells the story of Mark Hogancamp (Steve Carell) who was a victim of a brutal attack. He finds a unique and beautiful therapeutic outlet to help him through his recovery process. And yes, it's based on a true story. See the film for yourself when Welcome To Marwen is released December 21.